Besides the established bothies in the Cairngorms there are several refuges and howffs. 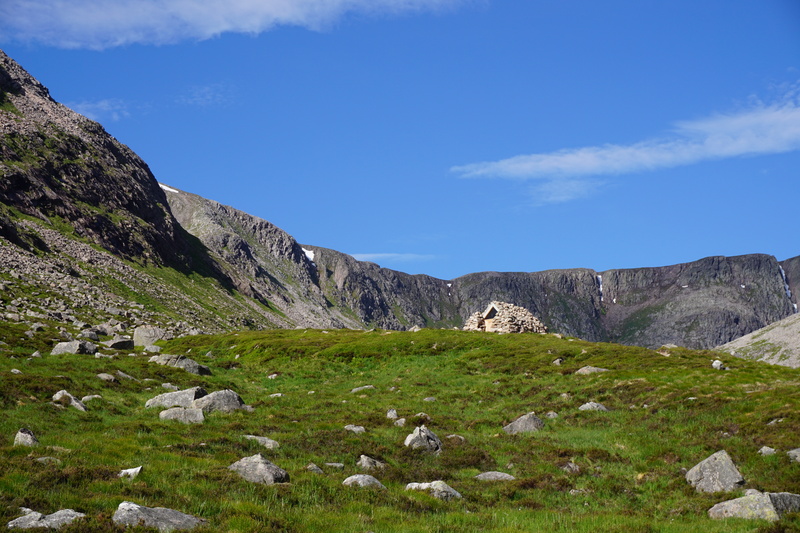 A refuge is differentiated from a bothy in that, where you might plan to stay in a bothy and (in the Cairngorms at least) expect certain standards, a refuge will be smaller, more basic, and designed only for emergency use. Howffs are unofficial shelters, most often under boulders – such as the Shelter Stone beside Loch Avon – but also including small built shelters such as the Secret Howff in the eastern Cairngorms. Whether it’s a refuge or a howff, you should expect to have to rough it a lot more and to have less room, possibly to the extent of not even having headroom to stand. However these shelters should be treated with the same respect and consideration as any bothy and all your litter should be removed, along with any other litter you find there. Although the Fords of Avon Refuge and Garbh Coire Refuge are maintained by the MBA, some of the howffs have no formal maintenance arrangements, leaving them particularly vulnerable to irresponsible behaviour.